According to scholarly opinion, the Cairo Codex of the Prophets was not written in the ninth century; it was not written by a Karaite; and it certainly was not written by Moshe ben Asher. Everyone who has seen the Cairo Codex says that it is breathtakingly beautiful. The Codex was stored in the Moses al D’ari Karaite synagogue in Abassaya (a region of Cairo). [2.] And the Codex often would be on display in the sanctuary on holidays. The community would form a line to walk by the Codex and catch a glimpse of this jewel – even if just for a moment. My uncle told me that he got goose-bumps just looking at it. I’ve wanted to write about the Cairo Codex for over a year, but I could not find any Karaite with clear enough memories to help me with an article. Not till this last Yom Kippur. On Yom Kippur, during one of my drashes, someone asked me about the Aleppo Codex. The Aleppo Codex is considered the most perfect manuscript of the entire Tanakh. So, I explained how a professor – named Dr. Rafael Zer – proved (rather conclusively) that the masorete of the Aleppo Codex was a Karaite Jew. [3.] The Aleppo Codex was completed around the year 930. According to the colophon of the Aleppo Codex, the masorete of the Codex was Aharon ben Moshe ben Asher. 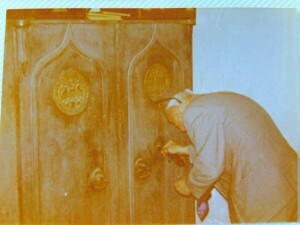 The cabinet housing the Cairo Codex: opening the cabinet requires two different keys. The cabinet that housed the Cairo Codex also housed other very valuable manuscripts, some of which can be seen here. Karaites (still living in Cairo at the time) with the Cairo Codex. But here we are in the middle of Sukkot, and Sukkot is a holiday during which we are supposed to rejoice for seven days. (Leviticus 23:39-40.) Although I can no longer rejoice at the Karaite contribution toward vocalizing the Cairo Codex, I have so much else to rejoice about. 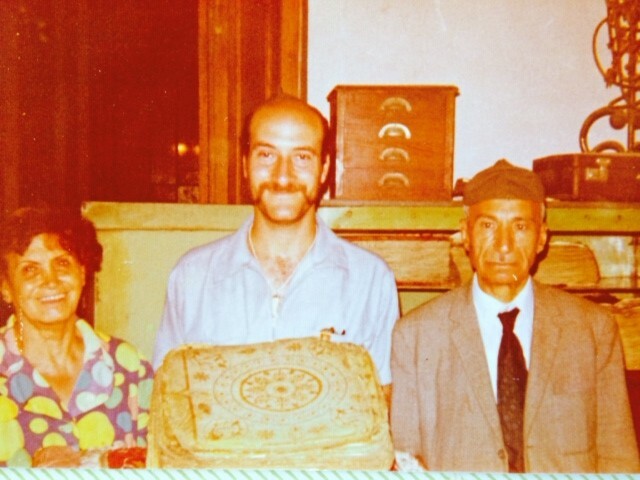 The Karaite community should be proud for having maintained this ancient manuscript for centuries – much like the Rabbanite community should be proud for having maintained the Aleppo Codex for the last several centuries. 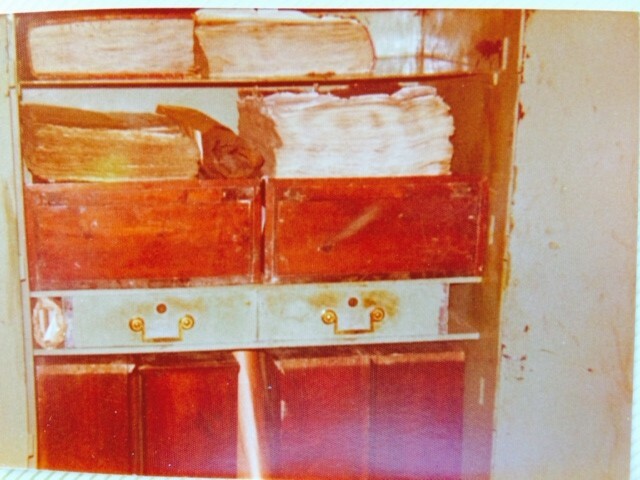 For the first time in my life, I saw pictures of where the Cairo Codex was stored, who was watching over it, and what it looked like. And I learned how Jacob Moussa was so enamored by the beauty of the Cairo Codex that he wanted everyone in our synagogue (and now everyone on the Internet) to see it. After all, isn’t that exactly what a religious manuscript is supposed to do? Whether the scribe was a Karaite or a Rabbanite, the scribe performed his function admirably by providing Jews with a meaningful connection to our religion, to our traditions, and to our God. My Note: I pieced this together from a transcript of Nehemia’s recording; so if it is not precise – it probably an error on my part or in the transcript itself. You can view the colophon at the end of this document. If, as scholars suggest, the Cairo Codex was not written by Moshe ben Asher, then the colophon is not a reliable depiction of how this manuscript came to be. [2.] My father used to pray at the Moshe al D’ari synagogue. Here is the exterior of the synagogue – both mid-1900s and after its recent renovation. Photos courtesy of the Nebi Daniel Association. [3.] See Raphael Zer, “Was the Masorete of the Aleppo Codex Rabbinical or Karaite?” Sefunot N.S. 8 (23), 2003, pp. 573-587 (Hebrew); Studies of the Hebrew University Bible Project, ISSN 0082-3767 (2009) vol. 24, p. 239-262 (English). Professor Zer expressed no opinion as to whether Aharon ben Asher was, in fact, the Masorete. Professor Zer only demonstrated that the masorete (whoever he was) was a Karaite. [4.] Moussa is a common Egyptian Karaite last name in the U.S. (and perhaps Israel as well). It is Arabic for Moses. 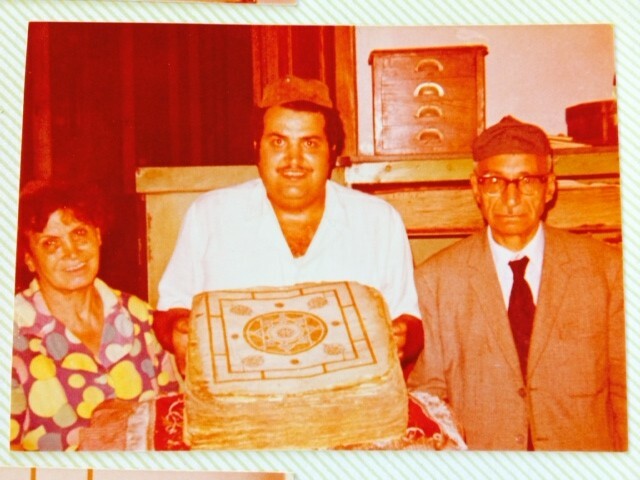 The very large (and extended) Moussa family are among the greatest contributors to the Karaite Jews of America. 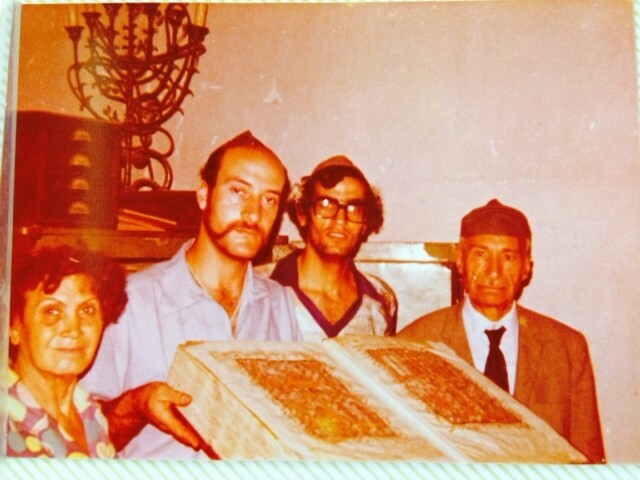 Jacob Moussa and his son made the Torah case that houses the Torah from which the Karaite Jews of America reads every Shabbat. [5.] I cannot find any publicly available images of these pages of the codex to verify independently that this is the actual Cairo Codex – as opposed to another rare manuscript. But everyone who has seen the Codex and these photos confirmed that it is the Codex. The shape of the pages in these photos match the shape of the facsimile images available online here. The online edition does not have the illuminated pages. According to many, the Cairo Codex had 13 illuminated pages. Mr. Moussa says that the difference in the Codex art in these photos resulted from “turning” to a new page in the manuscript. The manuscript from the one at the top of this post is not the Cairo Codex; I have not been able to identify which manuscript it is. [6.] The professor knew I was writing this article, but I did not seek his permission to quote him in this story; so I will not mention his name. I will just summarize the information he conveyed to me on October 13, 2014: 1) the Masora of the Cairo Codex indicates it was written by a Rabbanite – as is evidenced, in part, by the numerous Masoretic notes from Rabbinic midrashim; 2) carbon-14 dating on the manuscript shows that the manuscript could not have been written earlier than the 11th century (making it impossible for it to have been written by Moshe ben Asher); 3) even before the carbon dating, two professors wrote articles showing that the Cairo Codex was not written by Moshe ben Asher and that the Cairo Codex was written after 895/896; and 4) the vocalization of the Cairo Codex follows the ben Naftali scribal tradition more closely than the ben Asher scribal tradition. My Note: I understand that the Cairo Codex suffered some damage in a fire. I do not know what effect the smoke damage would have had on the carbon-14 dating. I presume the people performing the test accounted for this; and, in any event, other evidence suggests that the Codex is not from Moshe Ben Asher. [7.] This is still true with respect to the Aleppo Codex, which is the most considered the most perfect (ancient) copy of the Bible. My Note: I have several Hebrew articles regarding the more interesting Masoretic notes in the Cairo Codex. If you are a scholar and would like to read them, I am happy to send them along; but you have to promise to use them for scholarly purposes (and not to abuse the copyright of those articles). Drop me a note below. Thank you for sharing this information. KG, Esq. Thank you for this great informational article you have written. I would like the notes on the scholarly articles for further study. Thank you for this wonderful article. I would very much like to see the scholarly articles you mention, and thank you for offering them. Thank you; I will send them to your email. I sent this to your email. I can’t find the so called Cairo Codex mentioned in Wikipedia? Where can I find some more info on it? After I read your article, I went to Wikipedia and searched both the Codex of Aleppo and the one of Cairo and the information presented is very valuable. One can spend hours of enjoyment. Thank you for all your work. Yes, wonderful stuff; I’m not sure whether you’ve seen my post on the aleppo codex.